The first paper to get a grade for this semester! There are four from this semester still floating around in a professor's computer waiting to be slapped with a grade. Let's not forget the three other papers left to write. Here is it, as requested by one Mr Charles Bivona (of Facebook, Twitter and Blogging fame), in all of its 98% glory. The instructor for the class (Advertising and Society) is a tough cookie, and the topic chosen turned out to be logistically difficult in stringing together concepts to create a coherent argument, so the grade was a surprise. Of course now that it's done it looks ridiculously easy. In The Saturated Self Kenneth Gergen focuses on social saturation caused by technologies themselves as the forerunners to increasingly fragmented self identity. However apt Gergen’s argument may seem, there are byproducts of the relationship between people and technologies that may be the real perpetrators. One such byproduct of technology and human relation is the increased abundance and dissemination of information and knowledge through information technologies. As much as there is an abundance of information, so is there a wide range of types. This critique will focus on a particular kind of information, which is that created by advertising. The position is that it is information itself that impacts identity control, not necessarily technologies. Rather, it is the ways in which information is created, distributed and processed through technologies that proliferates ostensible fragmentation of self identity. Each stage of the technological revolutions - from printed words, to radio and film - has changed the shape of information and society, including how we understand and manage self identity. Focusing on information technologies, a connection can be created between advertising and the fragmentation of self identity in the post modern world. There are also strong implications for its nurturing of the “[...]populating of the self, [as well as] the acquisition of multiple and disparate potentials for being” as it fosters dissonance and anxiety in identity control. As cable television meant the end of shared cultural experience through nightly news, so does information technology further contribute to the loss of cohesive shared experiences, facilitating the fragmenting of self. New advertising strategies attributed to the rise of information technologies and computer-mediated environments may extend this further, not only propagating it, but catering to a fragmented identities in society. Advertising is a form of marketing communication and a medium of information. Advertising provides information about a product’s capabilities and characteristics, but it also informs culture through the use of symbols, creating “cultural materials”, cultivating and confirming stereotypes, influencing how we understand ourselves in the social world, as well as impacting the perceptions of the world in which we live. The primary way in which we receive these information messages is through technologies, which have progressed from print to today’s information technologies. Whether we acknowledge it or not, advertising information affects the subconscious, which guides our cognition in our self-identification construction. Reflecting on the writing of Karl Marx, Neil Postman, in Technolopy, proposed that technologies influence people’s perception of social and mental life, which in effect influences culture. As Gergen further illustrates,“emerging technologies saturate us with the voices of humankind” and these voices, whether they be in the form of entertainment, advertising, or social interaction, carry information messages. 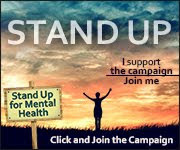 The exposure to these vast range of messages can lead to loss of coherent identity and to the fragmentation of self identity, “increasing sensitivity to the social construction of reality”, thereby increasing anxiety as we struggle with information that does not conform to our concept of self in a process called cognitive conservatism. The messages and information of advertising continues to change, mirroring the evolution of society. With the growth of information technology, advertising messages continue to become more about the consumer of the product than the product itself, pandering to the insecurities of the target audience. Advertising uses “cultural cues to communicate fairly complex messages [...] exploiting stereotypes and cultural references” further capitalizing on anxieties of fragmented self-identity. There is a sweeping shift in our exposure to advertising information, as well as advertising’s exposure to our information. As marketing moves away from a traditional approach, developing new strategies like niche or target advertsing, taking advantage of innovations like cookies, tracking pixels, and developing emotional analysis software, the ability to cater to aspects of the fragmented self identity increases and persists. As technologist David Weinberger asserts, “by pulling together implicit data from multiple sources, marketers can avoid being fooled by our lopsided self-presentations on any one site”. This not only validates the fragmentation of identity but facilitates the maintenance. However, it is not perfect validation just yet. As Nikhil Seith wrote in an article for AdWeek, while meaningful messages cannot be crafted if identity is not understood - which is achieved through data - so far marketing isn’t doing an adequate job. Cookies aren’t really enough. The answer, according to Seith, is The Internet of Things - wiring your physical world to your digital world in order, which will combine increasing amounts of fragments and craft a more cohesive identity. Therein lies the holy grail of advertising in its quest to profit from the satisfaction and validation of every theoretical fragment of self. A technology focused and saturated society is a condition of ”culture [and] a state of mind”. Gergen asserts that saturation by technology is contributing to the reformation of society, and that this has implications on knowledge and information. As the shape of knowledge and information becomes an increasingly social construction, involving networks of people, so does the dissemination of cultural information inform an even greater population. Through the new network of knowledge not only do previous authorities on information lose the “singular” power of their voice, contributing to “the erosion of authority”, but the amount of information is expanded. The revitalized authority of advertising messages in the hands of the masses, incorporated with the vast networks afforded by information technologies, leads to “dynamic” cultural influences and “multiple cultural knowledge systems” which individuals employ to “understand, interpret, and behave” in any given situation. Given the multiple contexts of the world and information that information technology provides, “no transcendent voice remains to fix the reality of selves [into place]”. In the information fueled world of the technology focused society, the definitions of reality become redefined, including definitions of self and identity, creating platforms through which “a barrage of new criteria for self-evaluation” are realized. Further, expectations are redefined due to increased information which “may also disrupt the social and psychological processes underlying identification through which individuals come to understand who they are as persons”. As Gergen states, “the technological achievements of the past century have produced a radical shift in our exposure to each other” pushing people closer, subjecting them to growing numbers of populations, which propagates unimagined relationships. There is an endless juxtaposition of information messages from diverse social groups competing with those of companies and products through advertising. This increases the amount of cultural information, cluttering media and culture with complex arrays of cultural messages about who a person is or should be, which increase identity control anxieties. Interaction with products and brands through the aforementioned social networking fosters the “manifestations of relatedness” in which “face-to-face encounter[s]” and “reciprocal interchange” become irrelevant in fostering and maintenance of valid relationship paradigms. Gergen warns that “[...] one must be prepared for the possibility that media figures do enter significantly into people’s personal lives”. This effectively plays out in celebrity endorsements and ‘celebrity as brand’ where personalities essentially become the brand or product. There is an undeniable allure and power of celebrities as a persuasive power. By using celebrity to forge “genuine, long-term relationships” brands create “meaningful ways to engage customers” by infusing “genuine personality in their brand” or product and cultivating a bond. This creates an environment in which a consumer can have a perceived relationship with entertainment personalities, particularly through social networking. The cumulative effect of this advertising strategy creates a significant informant of a branded personality whose messages can have a powerful impact on the fragmented construction of self identity, “allow[ing] customers to makes a statement about who they are” through their relationship with the brands. All social situations, whether it be “non-digital” or information technology-mediated, are environments where “we make ourselves intelligible to each other” while gathering “[information of] others’ patterns of being”. Brands strive to create relationships with consumers through advertising strategies such as branded personalities, creating a plethora of identity information, and therefore become a further catalyst to the construction of self identity. Understanding ourselves through interpersonal relationships, group affiliations, and advertising messages - sometimes presented by a figure who is influential on an interpersonal level - continually adds to, influences, and changes the information we have available for identity control. While all of these social relationships may be seen as a catalyst to the “multiphrenic condition [...] in which one swims in ever-shifting, concatenating, and contentious currents of being”, it is still the information provided that is used to guide, shape, and instruct self identity. In Gergen’s postmodernism sphere, we are doubtful about who we are, “dismantled” and lacking any “real and identifiable characteristics – such as rationality, emotion [...] exist[ing] in a state of continuous construction and reconstruction”. Accordingly, this postmodern dystopian perspective encourages the “[...] populating of the self, reflecting the infusion of partial identities” creating environments in which Gergen claims there is no essence of self to remain true to. Gergen attributes this phenomenon to social saturation, but it may be something more; it may be the seemingly disordered heap of information that technology encourages, and it may be a reasonable response to the circumstance. The fragmentation of self may be a completely rational and natural outcome in the domain of an advanced technological world experiencing a glut of cultural information. Drawing from a modernist perspective of self, where “knowledge of the world is built up through observation [and] it is not by virtue of heredity that we are who are, but by observation of the environment”, we can infer that our environment influences and shapes our identity. We are what we see, hear and learn. We are what we are exposed to, and if we are exposed to scads of mixed information messages over time, then we become fragmented. Therefore, varying cultural messages, which influence us subconsciously will shape identity and corresponding gradients of self. To put it plainly, rather than understanding identity as being an innate inherited construct, we can recognize it as flexible. Just as we have learned to “juggle multiple principles of [information] organization [in the networked world] without even thinking about it”, over time so have we learned to monitor and implement aspects of identity, while in some instances, becoming overwrought with the violation of our sense of identity. Gergen’s assertion is that “the fully saturated self becomes no self at all” and that technology which leads to social saturation is to blame. This smacks of “technodeterminism”, attributing the fragmentation of self to new technologies gives technology authority and power. We are not being “made” by technology, even though its influence can certainly be seen as a factor. It is not technology, nor simply the social aspects perpetuated by it; it is the propagation of and exposure to its information, the glut of it, that fragments our sense of self. To better clarify, if it was purely a social issue, and one was exposed to one hundred people in an echo chamber, fragmentation would be unlikely compared to being exposed to one hundred people with twenty different polarizing viewpoints. Ergo, social saturation does not guarantee a fragmented self identity. In a rejection of Gergen’s usage of the term ”multiphrenic condition” and “unlimited multiplicity”, what he sees as “multiplicity” can be defined as “adjusted self” and is just one coping mechanism used when presented with a challenge to identity, like incompatible demands, in which an outcome can be a redefined identity. People have always had to maintain separate “selves” - i.e. work self, family self, social self - “performing a variety of roles” throughout any given day in a process called identity management. It is true that information technologies, such as social medias, intermixes these places or states of identity - for instance causing your “work identity” and “social identity” to collide - causing friction in maintaining all of the so-called “selves” a person must sustain as they move not only through the tangible world, but the digital as well. The condition of which he speaks is not that of separate identities, but gradients of a single identity that society encourages the individual to compartmentalize in order to be accepted. Gergen asserted that “[Information] technologies of social saturation are central to the contemporary erasure of individual self”. However, they may not actually be an erasure. These technologies, and more aptly the information produced through these technologies, may add, or simply alter “an individual’s sense of self”, encouraging self realization and reinforcing self perception while influencing all aspects of their identity. Additionally, information technologies create opportunities, “enriching our potential for seeing connections and understanding things in contexts we have never considered” before. In this way these technologies are an enhancer, not an erasure. Perhaps the answer lies in a more sophisticated understanding of the impacts of advertising information on self identity, the opportunities new technologies afford, and the recognition of the consequences of errant acceptance of vast array of messages that society is bombarded with every day through information technologies. Postman, Neil. Technopoly: The Surrender of Culture to Technology. New York: Vintage Books, 1993. 67. Gergen, Kenneth J. The Saturated Self: Dilemmas of Identity in Contemporary Life. New York, NY: Basic Books, 2000. 69. Weinberger, David. Everything Is Miscellaneous: The Power of the New Digital Disorder. New York: Holt Paperbacks, 2007. 130. Bartholomew, Mark. "Advertising and Social Identity." Buffalo Law Review 58 (2010): 931-76. Postman, Neil. Technopoly: The Surrender of Culture to Technology. New York: Vintage Books, 1993. 21. Gergen, Kenneth J. The Saturated Self: Dilemmas of Identity in Contemporary Life. New York, NY: Basic Books, 2000. 6. Gergen, Kenneth J. The Saturated Self: Dilemmas of Identity in Contemporary Life. New York, NY: Basic Books, 2000. 16. Adler, Ronald B., and Russell F. Proctor. 14th ed. Australia: Thomson/Wadsworth, 2014. 45. Reilly, Terry Edward, and Mike Tennant. The Age of Persuasion: How Marketing Ate Our Culture. Berkeley, Calif.: Counterpoint :, 2009. 162. McChesney, Robert Waterman. "Does Capitalism Equal Democracy: Advertising." In Digital Disconnect: How Capitalism Is Turning the Internet against Democracy, 41-46. New York, New York: New Press, 2013. McChesney, Robert Waterman. "Does Capitalism Equal Democracy: Advertising." In Digital Disconnect: How Capitalism Is Turning the Internet against Democracy, 41-46. New York, New York: New Press, 2013. 157. Weinberger, David. Everything Is Miscellaneous: The Power of the New Digital Disorder. New York: Holt Paperbacks, 2007. 163. Sethi, Nikhil. "The Future of Advertising Hinges on Understanding Identity." AdWeek. December 9, 2013. Gergen, Kenneth J. The Saturated Self: Dilemmas of Identity in Contemporary Life. New York, NY: Basic Books, 2000. 119. Weinberger, David. Everything Is Miscellaneous: The Power of the New Digital Disorder. New York: Holt Paperbacks, 2007. Weinberger, David. Too Big to Know: Rethinking Knowledge Now That the Facts Aren't the Facts, Experts Are Everywhere, and the Smartest Person in the Room Is the Room. New York: Basic Books, 2011. Hong, Ying-yi, and Desiree YeeLing Phua. "In Search of Culture’s Role in Influencing Individual Social Behaviour." Asian Journal of Social Psychology 16 (2013): 26-29. Gergen, Kenneth J. The Saturated Self: Dilemmas of Identity in Contemporary Life. New York, NY: Basic Books, 2000. 138. Postman, Neil. Technopoly: The Surrender of Culture to Technology. New York: Vintage Books, 1993. 48, 60. Gergen, Kenneth J. The Saturated Self: Dilemmas of Identity in Contemporary Life. New York, NY: Basic Books, 2000. Xix, 76. Gergen, Kenneth J. The Saturated Self: Dilemmas of Identity in Contemporary Life. New York, NY: Basic Books, 2000. 41, xi, 53. Gergen, Kenneth J. The Saturated Self: Dilemmas of Identity in Contemporary Life. New York, NY: Basic Books, 2000. 170, 155-156. Gergen, Kenneth J. The Saturated Self: Dilemmas of Identity in Contemporary Life. New York, NY: Basic Books, 2000. 56. Reilly, Terry Edward, and Mike Tennant. The Age of Persuasion: How Marketing Ate Our Culture. Berkeley, Calif.: Counterpoint. 2009. 221. Reilly, Terry Edward, and Mike Tennant. The Age of Persuasion: How Marketing Ate Our Culture. Berkeley, Calif.: Counterpoint :, 2009. 227. Reilly, Terry Edward, and Mike Tennant. The Age of Persuasion: How Marketing Ate Our Culture. Berkeley, Calif.: Counterpoint. 2009. 268, 221. Reilly, Terry Edward, and Mike Tennant. The Age of Persuasion: How Marketing Ate Our Culture. Berkeley, Calif.: Counterpoint. 2009. 221. 196. Reilly, Terry Edward, and Mike Tennant. The Age of Persuasion: How Marketing Ate Our Culture. Berkeley, Calif.: Counterpoint. 2009. 242, 268. Gergen, Kenneth J. The Saturated Self: Dilemmas of Identity in Contemporary Life. New York, NY: Basic Books, 2000. 80. Gergen, Kenneth J. The Saturated Self: Dilemmas of Identity in Contemporary Life. New York, NY: Basic Books, 2000. 7, 49. Gergen, Kenneth J. The Saturated Self: Dilemmas of Identity in Contemporary Life. New York, NY: Basic Books, 2000. 4, 138. Gergen, Kenneth J. The Saturated Self: Dilemmas of Identity in Contemporary Life. New York, NY: Basic Books, 2000. 41. Gergen, Kenneth J. The Saturated Self: Dilemmas of Identity in Contemporary Life. New York, NY: Basic Books, 2000. 17. Gergen, Kenneth J. The Saturated Self: Dilemmas of Identity in Contemporary Life. New York, NY: Basic Books, 2000. 7. Nach, Hamid, and Albert Lejeune. "Coping with Information Technology Challenges to Identity: A Theoretical Framework." Computers in Human Behavior, 200, 618-29. Adler, Ronald B., and Russell F. Proctor. "Communication and Identity: Creating and Presenting Self." In Looking Out/looking in, 51-58. 14th ed. Australia: Thomson/Wadsworth, 2014. Gergen, Kenneth J. The Saturated Self: Dilemmas of Identity in Contemporary Life. New York, NY: Basic Books, 2000. 49. Nach, Hamid, and Albert Lejeune. "Coping with Information Technology Challenges to Identity: A Theoretical Framework." Computers in Human Behavior, 200, 618. Gonzales, Amy, and Jeffrey Hancock. "Identity Shift In Computer-Mediated Environments. "Media Psychology 11, no. 2 (2014): 167-85. Weinberger, David. Everything Is Miscellaneous: The Power of the New Digital Disorder. New York: Holt Paperbacks, 2007. 124. Adler, Ronald B., and Russell F. Proctor. 14th ed. Australia: Thomson/Wadsworth, 2014. Gergen, Kenneth J. The Saturated Self: Dilemmas of Identity in Contemporary Life. New York, NY: Basic Books, 2000. Reilly, Terry Edward, and Mike Tennant. The Age of Persuasion: How Marketing Ate Our Culture. Berkeley, Calif.: Counterpoint. 2009. Sethi, Nikhil. "The Future of Advertising Hinges on Understanding Identity." AdWeek. December 9, 2013. http://www.adweek.com/news/advertising-branding/future-advertising-hinges-understanding-identity-154330. There are about five weeks left before graduation. Graduation! With some exciting opportunities waiting for us at the end of the graduation stage, it can't get here fast enough...but for the countless papers yet to be written. With three of the nine papers under the belt [none of which have been graded yet] (not counting a small writing project that doesn't count as a paper) it felt time to post at least one, at least in interest of keeping the blog active and ready for when there is more time to write for personal fun and enjoyment. The following isn't a paper that poses an argument. It's a reflection paper, much like those from the Truth, Knowledge and Reality Class last Spring semester (See: Critical Reflections on: 'Free Will' by Sam Harris, 'Why Truth Matters' by Michael P. Lynch, 'When Science Meets Religion' by Ian G Barbour, and 'On Being Certain' by Robert A Burton). It is for an independent reading and study course in Communications of which there are six (self-selected) books.You probably won't see all of the resulting papers here because...well...to be honest you can't put the same amount of effort in every paper when you have nearly 10 to write within about an eight week time frame. 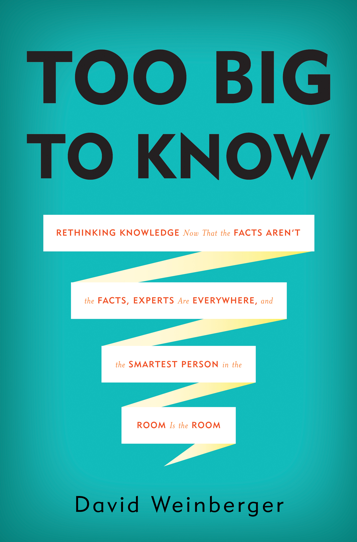 The room is the smartest person, according to David Weinberger in ‘Too Big to Know: Rethinking Knowledge Now That the Facts Aren’t theFacts, Experts are Everywhere, and the Smartest Person in the Room Is the Room’. Of course, once you being to understand what he means by the room, your whole concept of information, knowledge and expertise are restructured, as it should be in the world of interconnectedness. The room is the smartest person, so it goes. However, the room is not exactly a room, and the room is made of networks not walls, and the network is made up of people not conduit. The room is made up of people who, in the new structure of knowledge, become individually insignificant. Rather, they gain significance as a whole in the new organization of knowledge: networks, which make up the body of information, or data. The knowledge is in the network of information (people) itself, the culmination of expertise and knowledge (people) that inhabit the room, which is the very structure of the room. It is in this network where information is transformed into what Skip Walter refers to as “actionable” knowledge which is simply information that is used for a purpose and therefore has significance (3). The smartest room, this network of knowledge, exists on the internet, in social connections. These networks have developed as places of associations between “lots of people who are different from one another [where they are] not only finding expertise but also generating it” (57). This environment has taken the shape of knowledge, previously linear in nature, and transformed it into not just a circular form, but various forms involving symbiotic relationships. Previous to Too Big To Know the idea that knowledge has a shape was, personally, a foreign concept. Weinberger manages to describe how the shape of knowledge has evolved from linear structure – such as one direction information like that presented in books – to a multi-directional web of information in which the seeker can discover information and knowledge in any number of ways as well as add to it (100). Despite this new structure of knowledge it has a life which is akin to the life of the old linear knowledge in that it has the same old problems and can be “misquoted, degraded, enhanced, incorporated, passed around through a thousand degrees of misunderstanding, and assimilated to the point of invisibility” (110). Only previously, the editorial nature of knowledge and expertise prior to the Net was that of privilege, whereas now the editorial nature provided by networks is in the hands of the masses. Expertise has multiple voices thanks to the new structure, and that doesn’t always have positive implications (67). It is in the hands of the masses that expertise on any one topic can have an array of implications. It is that trait where the network gets its diversity, where it “[…] enables a type of expertise just about impossible to actualize before the Internet existed” and gains “value only because that network contains many different types of people” (55). The variety is not just in the mere connections of countless people through the network, it is the variety of ways in which they think and what they know (56). The issue in the network is in the sifting of the large mass of knowledge created by it, to moderate it to a point of usefulness. It calls for a new method of filtering which is now done through methods of influence through social networks. Weinberg says this can be disruptive, especially when it comes to authority of knowledge where it is transferred from experts to people we know (10) – theoretically people who have no valid authority. When information and knowledge is shifted from central “authorities” to an array of influences, both in our social networks as well as the expanded networks connected to them, we are bombarded with fragmented information. This fragmented information shapes perceptions and attitudes. This information may be outside the scope of new authoritarian social networks who never the less are granted authority over the information transformed into knowledge. In this way the information is not so much reduced by filtering as it is should be, but it is compounded; this form of filtering “increase[s] information and reveal[s] the whole deep sea” (13). Weinberger says this mass of information “has consequences” (10), and he proceeds with outlining many of the pros and cons of this new “anything goes” nature of information generation and dissemination. Perhaps one of the most interesting concepts Weinberger presented as a pro to the network is a new take on diversity, which is the cornerstone of the “smartest room” in question. The proposal is that the concept of diversity is growing away from that of an ethnic or racial structure, to that of a diversity of backgrounds, education levels, economic levels and experiences that flow through all, regardless of religion, gender, sexual orientation or racial identity. This slow-growing concept, particularly in business, is an idea outside of the popular rhetoric of what traditional diversity is and means. The kind of diversity Weinberg discusses works by creating a range of new perspectives with heuristic implications which in the workplace presents as innovation and creativity. This form of diversity builds on new ways of seeing and doing and battles against the group-think, which leads to mediocrity (77). This new understanding of diversity can be seen as having potentially ill effects if adopted to broadly, such as the reversal of anti-discrimination legislation. However, for the purposed of the network it can be a positive revolutionary force, as well as a carrying negative attributes. As Weinberger is sure to point out at various steps, the revolutionary nature of networks does not mean they are all universally smart, or even that the network is universally used. As he points out, referencing the work of researchers Eszter Hargittai and Danah Boyd, “social class, age, and subculture affects [s] how we use the [network] and what it means to us (173). To further illustrate the psychological pitfalls of the usefulness of the network (i.e. the internet), Weinberger states that “for those who have no interest in intellectual rigor, or who lack curiosity […] the Net may well be an environment that degrades knowledge” (91). In these ways the diversity of global society does not translate directly to the diversity of “the room”. When diversity is functioning properly in the network of “the room” knowledge is built vis-à-vis shared expertise. When done on a mass scale, cognition “quickly migrate[s] to these networks of experts” (62). However, though “knowledge has always been social” in much this way, and the theory goes that we are “smarter when together” the fact is that this isn’t always the case with networked knowledge (51). Now that authority of knowledge is in the hands of the masses, Weinberg makes a claim that the lack of a privileged position introduces the worry that “we will be lost in a swirl of contradictory ideas” (90-91). It is difficult not to see how this plays out in everyday dissemination of information on the net. As Weinberger says, in some cases the network is dumber (67) for its mass cognitive blend, creating misrepresentations (66) and having an isolating effect on information (63). Networks are subject to forming insulation from criticism and outside points of view, resulting in echo chambers (63). According to Weinberger, citing the work of Cass Sunstein, this type of insulated echo chamber can lead to the breeding of extremism (83). In the network, extremism birthed from isolation is counter intuitive to the positive creative nature found in the aforementioned diversity, a nature which promotes a more objective view than those of static ideologies. This problem is at the root of what Cass Sunstein calls “information cascades [where] false and harmful ideas […] gain velocity [and credibility by how easily] and frequently they are forwarded”, passed on, or shared (117). One not need be in the network of the internet long to recognize this outcome is not only real, but persistent. To further the point in his parlay of cons of the network, Weinberger reflects on the work of techno-dystopian Nicholas Carr, who says that what the internet is doing is changing our cognitive processes for the worst. While on some level this may be an accurate perception for some, it is highly technodeterministic, as Weinberger confers, to conclude that “technology causes us to use and understand it in particular ways” (173). The idea that technology acts upon us, causes as if by force, and not the other way around, has implications regarding ideas of free will and control in relation to the technological world. Other problems with information and knowledge transference in the network arise in interpretation, which, as Weinberger advises, is always subjective. Knowledge, in all of its structures, lives in the connection of life (119); and while it is accessible to all, sans the network in previous generations, it “shows itself to use depending on our starting point, viewpoint, and inescapably human sense of what matters to us” (180) and “all knowledge and experience is an interpretation” (89). Interpretation is essential to the transference of knowledge, but in “real events are experienced by individual minds that strive to create an accurate inner representation which is then expressed in words presented to others” (112) and creates a world in which they approach their understanding “from a particular standpoint (113). As Weinberger states, “our experience is always from a point of view, looking at some features and not others” (89), experiences of which there are countless ways in which to interpret everything (90). These experiences must contain context in order to be made sense of (90). Each frame of context carries the standpoints of the past with it which impacts the effectiveness of how we convey information and knowledge, as well as how we interpret it. Being left to figure out what is important about the evolving structure of knowledge, with its mass contribution of variable information from multiple standpoints, it is not hard to recognize the fatigue that transpires through the overload of the system. Even more are the implications on how to navigate what is available and come to terms with the death of authoritative knowledge. Understanding how to navigate these new structures and processes of knowledge is important, and are subject to a culture of their own which is “guided by implicit rules and expectations” and become important to aspects of social structure (90). The underlying fact is that knowledge is essential to the process of creating identity and culture, to understanding the world and ourselves (4). With a network of connectedness that inhabits many parts of the globe, bringing together a plethora of ideas, theories, and beliefs, “information overload [arises] as a cultural condition (9). The information provided isn’t necessarily essential, and the overload feeds the insecurity of our own knowledge and instincts. For example, Weinberger briefly remarks on child raising experts who dispense “skill […] often with just a few cogent mottos” (49). The consumption of books such as these types of boiled down common-sense guides to life illustrates the insecurity of our own knowledge, authentic knowledge passed down generation after generation, basic instinctual knowledge. When we erroneously put into the hands of the masses the authority on basic knowledge, it threatens the authentic self. With any number of experts available we often forget that within us is our own knowledge. For this reason “learning to evaluate knowledge claims” and developing critical-thinking skills becomes more essential than ever before (192). Unfortunately it often seems that critical thinking skills fall by the wayside as those who consume knowledge, dispensed from those who have been afforded authority on the grounds of nothing, neglect their own instinctual knowledge. With all of the cons, Weinberger still notes that “a net richer in metadata [information] is richer in more usable and useful knowledge” (188). Despite the range of expertise and useful knowledge created in the diversity of the network, he acknowledges that “we are going to disagree about everything”, attributing it to the very nature of diversity which inhabits the network of information and knowledge (87). The fact that our perceptions, beliefs, ideas and attitudes are individually shaped by so many different voices means each of us approaches the same knowledge set with different ways of viewing it. However, this can be recognized as nothing new; humanity has have never really agreed on anything. If it had agreed on anything, things would have remained the same throughout history. No revolutions, no loss of attributes deemed essential by some and inconsequential by others – no growth or change. Perhaps the networked world in which we now live in, in which everybody projects their voice into the abyss of knowledge and expertise, has simply been magnified by the network. Perhaps it was always like this, but through this new structure of knowledge, in the amplified connectedness of society, we now see how disconnected we really can be on various subjects such as those of human rights, politics, gender, religion, and any number of other less essential topics. Alas, Weinberger’s “pragmatic truth” sums it up, “what we have in common is not knowledge about which we agree but a shared world about which we will always disagree” (182). Throughout the book Weinberger probes how media, communication and information shapes and influences culture and the implications the new structure of knowledge has for the future. The topics laid before you were merely highlights and musings as there is neither time nor space to plumb the depths of his text for the purpose of this reflection. The best way to conclude is with Weinberger’s own utopian aspirations of the potential for “the smartest room”, optimistic and hopeful, that “…perhaps our hyperlinked infrastructure will give us a self-understanding that makes it easier for our curiosity and compassion to overcome our self-centered fears.” (193).